John P. Lundy provides the further interesting comment: “The Gnostics are the first we read of as having made any pictures of Christ, and as early as A.D. 150. It was by these sectaries, says M. Raoul Rochette….that little images of Christ were first fabricated, the original model or likeness of which was traced back to Pontius Pilate, who is said to have caused it to be taken from the Original. This we have from St. Irenaeus, who tells us of ‘a certain woman named Marcellina, of the sect of Carpocrates, who, to propagate the Gnostic doctrines at Rome, came from the far East, during the episcopate of Anicetus….They style themselves Gnostics. They also possess images, some of them painted, and others formed of different kinds of material; while they maintain that a likeness of Christ was made by Pilate at the time that Jesus lived among men. They crown these images, and set them up with the images of Plato and Pythagoras and the rest; and have other modes of honouring them after the same manner as the Gentiles.’ The mention of Anicetus fixes the date A.D. 156; and these images of Christ must have been in existence before, a possible example of which is on the title-page of this book, and which Agincourt claims to belong to the first century. It is like the story which Lampridius tells of the Emperor Alexander Severus, placing among his household gods the portraits of Christ and of Abraham, opposite to those of Orpheus and Apollonius of Tyana, and between images of the most revered kings and philosophers, paying them all a sort of divine homage.” (Monumental Christianity or the Art and Symbolism of the Primitive Church, 1876) The significance of Pontius Pilate’s involvement in the making of a portrait of Christ is intriguing. According to an apocryphal tradition in the non-canonical Gospel of Peter, Joseph of Arimathea (a relative of Jesus) was “the friend of Pilate and of the Lord”. Regarding the Face of Christ, the Rev. W.H. Withrow says: “Jerome conjectures that there must have been something celestial in his [Jesus] countenance and look, or the apostles would not immediately have followed him; and that the effulgence and majesty of the divinity within, which shone forth even in the human countenance, could not but attract at first sight all beholders. Chrysostom and Gregory of Nyssa in the East adopted this nobler conception, as also did Ambrose and Augustine in the West….no authentic portrait of Christ was recognized by the early church; nor was any strictly uniform type adopted. Eusebius, indeed, mentions reputed portraits of Our Lord associated with those of St. Peter and St. Paul; but they were apparently objects of mere local superstition, as was also the alleged statue of Christ at Caesarea Philippi, in which he was supposed to be represented as healing the woman with the issue of blood. The earliest acknowledged images of Christ were attributed to the Gnostic heretics, and were honoured with those of Homer, Pythagoras, Orpheus, and other heroes and sages by the eclectic philosophers of Rome [and apparently Pontius Pilate]…. 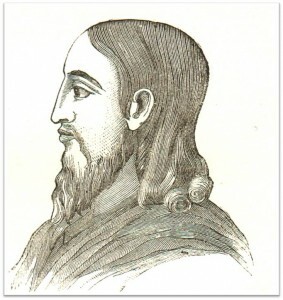 What is striking is the similarity between the oldest known portrait of Christ (probably 2nd century A.D.) from the catacomb of Callixtus in Rome, and the profile of Jesus on the medallion, found at the Druidic megalithic stone circle Bryn Gwyn, on Anglesey, North Wales, as mentioned above. Could this medallion, with its Hebrew inscription relating to Jesus, be of a similar early dating? If it is a later copy, who had access to the original portrait and why was it specifically used? And not with a Latin inscription as might have been expected but rather with ancient Hebraic glyphs. The 18th century antiquary, Henry Rowlands, was of the opinion that the Bryn Gwyn Jesus medallion could have been contemporary with the 1st century A.D. mission of Christ.